This elegant Chocolate Truffle Fudge selection is from Matthews 1812 House, where they bake all of their gourmet chocolate products in small batches in Cornwall, CT, and have been since 1979. These truffles are coated in dark chocolate with a variety of fudge and nut fillings, including walnuts, peanut butter, chocolate chips, and caramel. Godiva Chocolates are renowned worldwide for their silky smooth chocolates and truffles. Their Belgian chocolates were created in 1926 and are still favorites today. 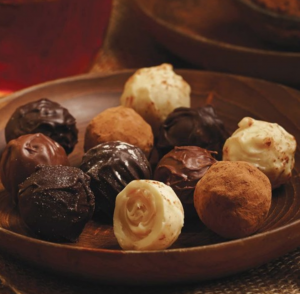 Shown here are the Godiva Dark Chocolate Truffles, their best-selling Signature Truffles, and Patisserie Truffles. Beautifully boxed and ready to enjoy. The Astor family has been making exquisite chocolates in New York since 1950. See all their chocolate truffles. Pictured here are cute Cupcake Truffles, their handmade signature Champagne Black Currant Chocolate Truffle, and Classique Milk and Dark Chocolate Hazelnut Truffles. All Astor chocolates are made in the USA. 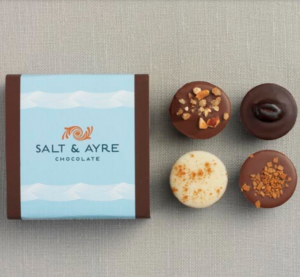 Harbor Sweets has been hand-making chocolates in Massachusetts since 1973. 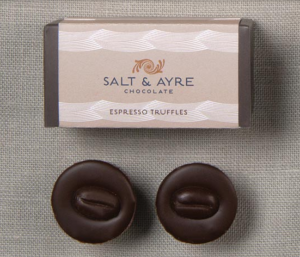 They have a delicious assortment of truffles: “Chai dusted with cinnamon, Espresso decorated with a chocolate coffee bean, Hazelnut with chopped carmelized hazelnuts, and Café au Lait sprinkled with coffee crisps.” All covered with a blend of white, milk and dark chocolate. Iconic See’s Candies, making chocolates for over 95 years, has a classic assortment of chocolate truffles to choose from. 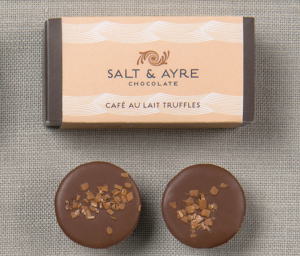 Enjoy their Chocolate Chip Truffle, their Gold Box Truffle assortment (one of PSC’s absolute lifetime favorites), or their best-selling Lemon Truffle. Truffle goodness from Dylan’s Candy Bar includes the Choc-A-Lot Artisan Truffles and Sea Salt Caramels, the Burnt Caramel Dark Chocolate Truffles and the Dark Chocolate Sea Salt Caramel Truffle Cups. And there’s more. You’ll want to hide these creamy Ethel M truffles. Ethel M (of M&M Mars fame) has 10 mouth-watering Truffles to choose from. 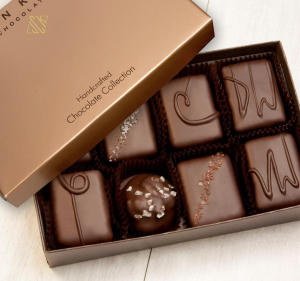 Pictured here are the Honey Dark Chocolate, the Truffle Assortment – including Espresso, Honey, Cinnamon, Vanilla, Milk Chocolate and Dark Chocolate – and the Milk Chocolate Pecan Pie Truffle. A favorite truffle worldwide, these Lindt Lindor truffles are available at Old Time Candy. Choices are dark chocolate truffles, milk chocolate truffles, or white chocolate truffles. Also available in boxes of 60 if you’re hoarding. Russell Stover candies has been an American institution providing delicious chocolates since 1923. They have a nice selection of Truffles, which are all made in the USA.